Although it’s 36 years since I last lived in England, I retain a deep affection for the country where I grew up, as well as my English accent (so say my American friends, anyway). I’m often asked my opinion of Brexit – I have British friends on both sides of the Leave/Remain divide. While I would have voted to stay in the EU, I can understand the opposite view, even while Leavers willfully ignore the strong economic arguments against their position. Few Americans would accept the loss of sovereignty required by EU membership. 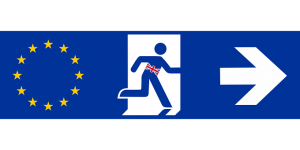 Freedom of movement means, in theory, all 440 million EU citizens not living in the UK could move there without the government being empowered to stop them. It’s not the only issue, but the biggest. Regulations imposed from by Eurocrats in Brussels cover mind-numbingly trivial standards for goods and services, all in the interests of creating a seamless market. Many of them are easily criticized and sometimes stupid. Nonetheless, the EU remains in Britain’s interest, in spite of these substantial drawbacks. A thoughtful essay in the Wall Street Journal (The Great Brexit Breakdown) insightfully noted that “You can have national sovereignty—and that’s fine. Or you can have economic integration—and that’s fine. But you can’t have both.” America has always been the EU’s vision. Its enormous domestic market and free movement of people are fully integrated, which partly explain faster productivity growth. Texans have no sovereignty (though some in the Lone Star state will disagree). But Europe is older and far more tribal. Texans share more values with New Yorkers than the English do with neighboring France. For an island nation, centuries of repelling European invaders isn’t easily replaced with passive acceptance of rule from “the Continent” (how the British refer to the rest of Europe). Since Britain voted by 52%-48% to leave the EU in the ill-considered June 2016 referendum, negotiations have plodded forward with in a predictable, crisis-free fashion. The UK is not alone of course in drifting towards regional political affiliations. As with the U.S., voting patterns were strongly linked to demographics, income and education. London and other major cities voted overwhelmingly to Remain, embracing Europe because of their ethnic diversity. Rural, older voters wanted to Leave. The more white your neighborhood, the less you liked Romanians arriving in your country, even if you rarely encountered them. It was also Old versus Young; those with less life ahead of them imposed their desire for yesterday’s Britain on others with decades still ahead.